Cereal and I have a love/hate relationship. 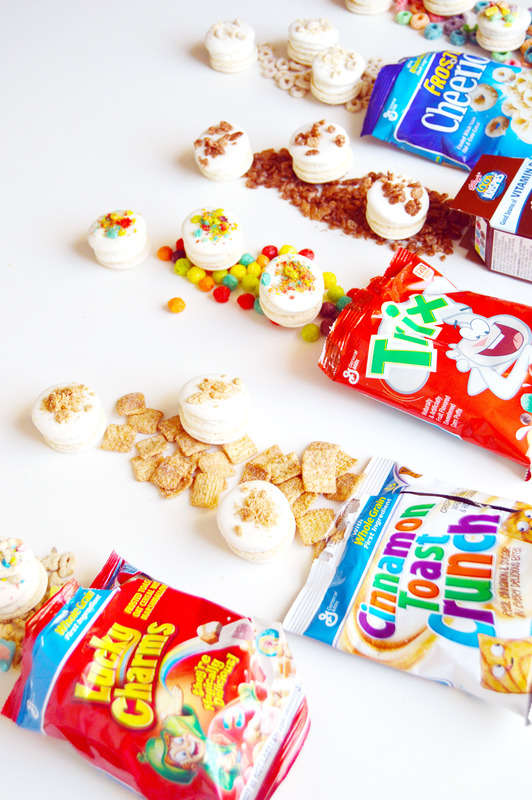 I love how there are endless flavors and textures, how each cereal turns plain milk into a unique drink, and how you can eat it for pretty much any meal or snack (and even when you run out of milk, you can eat it plain, kind of like teeny tiny cookies). On the other hand, I hate it for two reasons: 1) I pretty much cannot stop eating it once I open it up. It’s rare for me to have the “recommended serving”. I once took out a measuring cup and measured exactly one serving. Dude, it’s the size of my fist and I have small fists. 2) I hate soggy cereal. 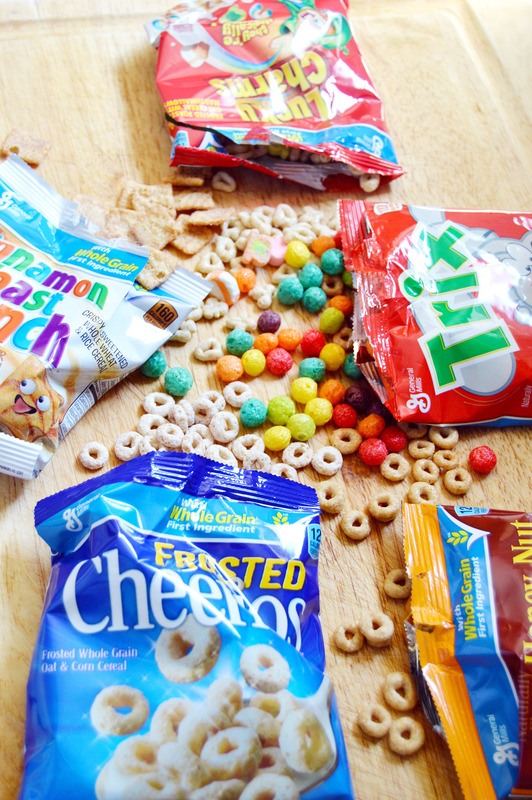 I think there is nothing worse than fully saturated cereal. It gets all mushy and some even start deteriorating into the milk. Don’t ask me to do something once that milk hits the bowl, because unless it’s a real emergency I’m taking the five minutes to eat it. 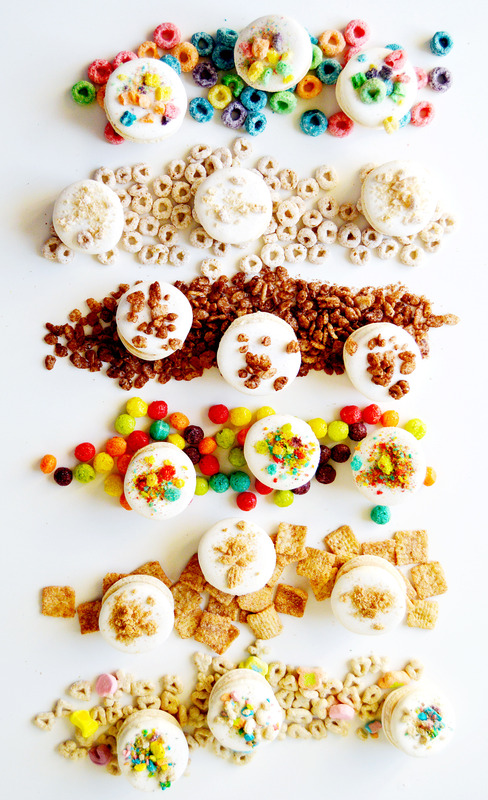 This recipe takes two of the best parts of cereal: the crispy bits and the cereal milk. 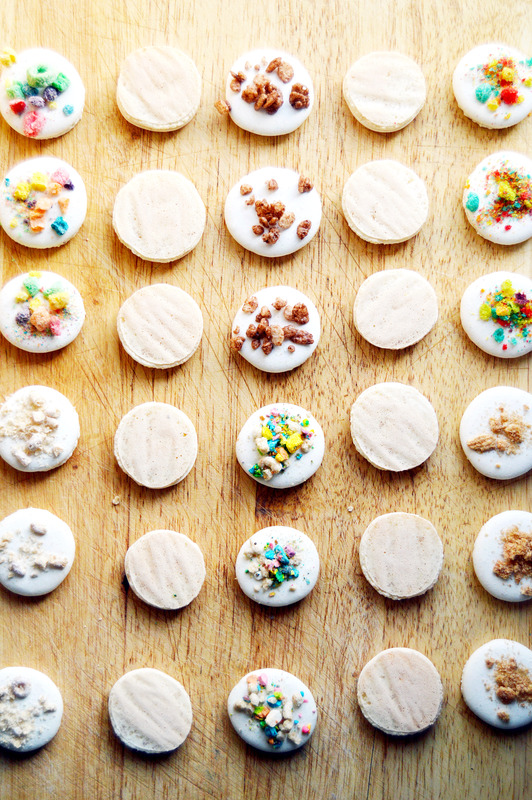 No sogginess, and you can customize each macaron flavor to whatever you wish! The cereal milk from this recipe tastes like the cereal milk you would get from Frosted Corn Flakes. (I got the inspiration from Momofuku Milk Bar’s cereal milk soft serve.) I suppose you could try using a different cereal (sans the toasting) and you would technically get the flavor that cereal’s milk. It was really exciting to watch them bake and I loved seeing them in so many different colors and textures. 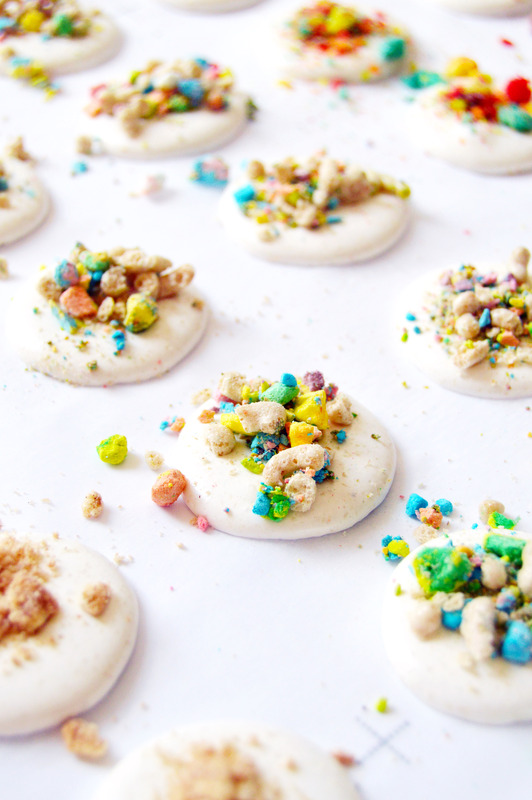 The Lucky Charms batch smelled especially good in the oven. I think it was the marshmallow bits baking and yes, they were magically delicious. 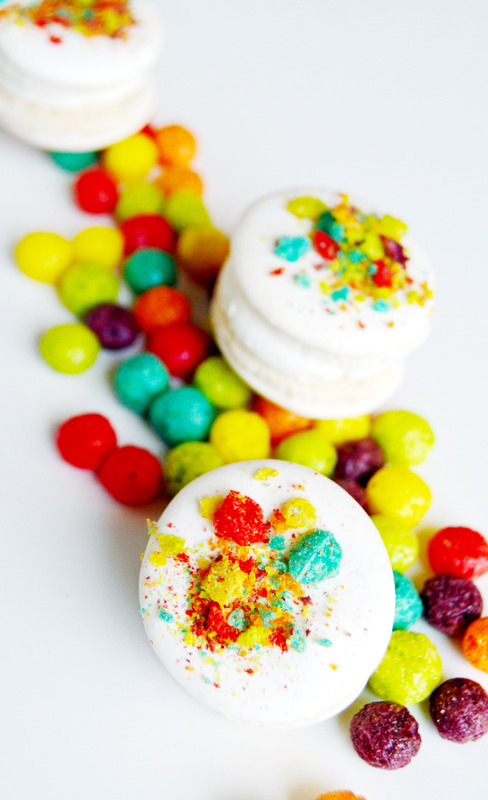 On half of the macaron shells, sprinkle on desired crushed cereal. 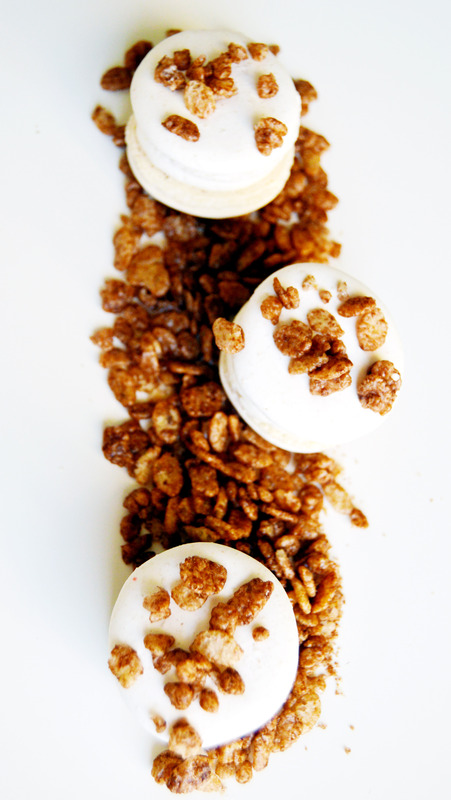 Pipe a dollop of cereal milk frosting on the plain macaron shell. 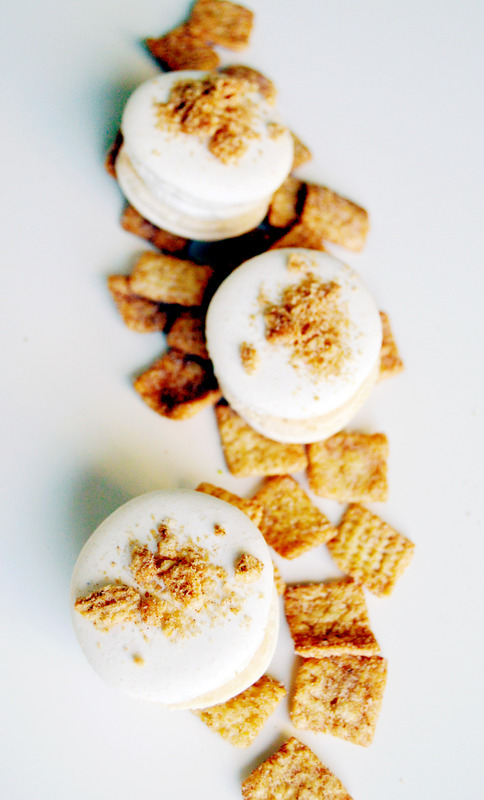 Top it with crushed cereal macaron, flattening it slightly to push the frosting to the outer edge. *This step is optional but I prefer to age my macarons. To do so, place assembled macarons in an airtight container and refrigerate overnight. The next day, the macaron shells will have softened slightly and in my opinion, more delicious. On a sheet pan lined with parchment paper, toast cereal for 5-7 minutes, until slightly deeper in color. In a large bowl, mix cereal and milk and steep for 30 minutes, until cereal is soggy. 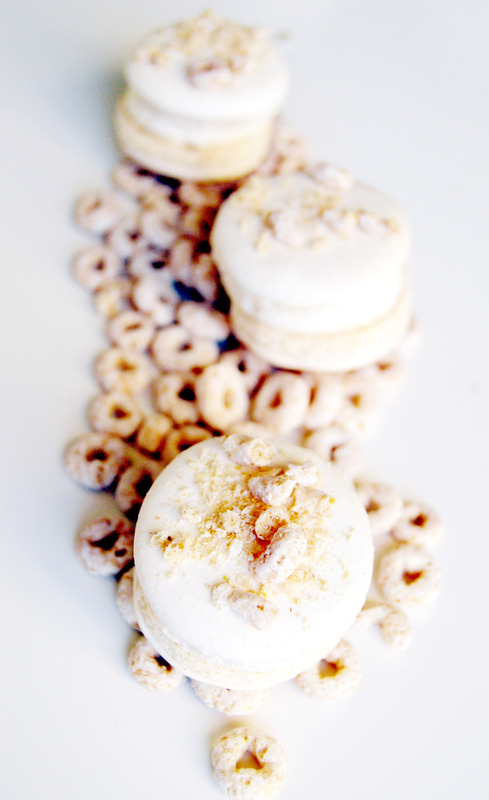 *Macaron recipe adapted from Bouchon Bakery by Thomas Keller, Sebastien Rouxel. 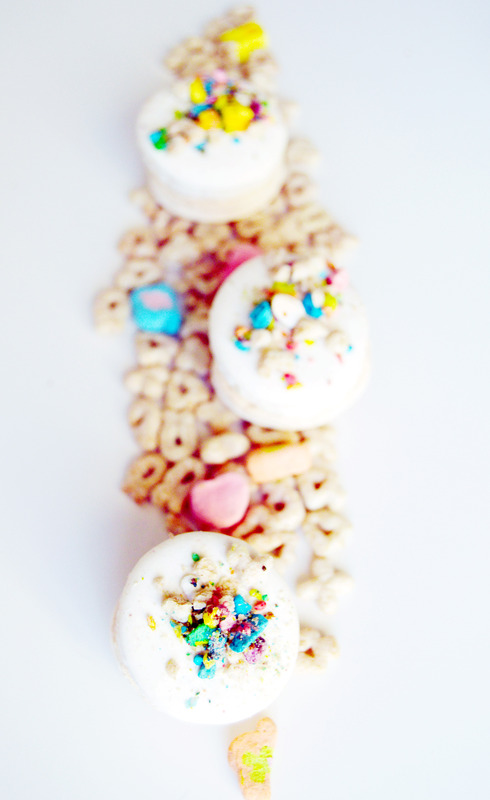 *Cereal milk recipe adapted from Momofuku Milk Bar by Christina Tosi, David Chang. This entry was posted in Cookies, Desserts, Macarons, Milk Bar, Vanilla and tagged cereal, chocolate, Cookies, dessert, Desserts, Macarons, milkbar, vanilla. Bookmark the permalink. What a terrific idea! I will take one of each flavor 🙂 These sound like so much fun to make too! Oh my gawd i can’t get over your photos! Just brilliant!!! 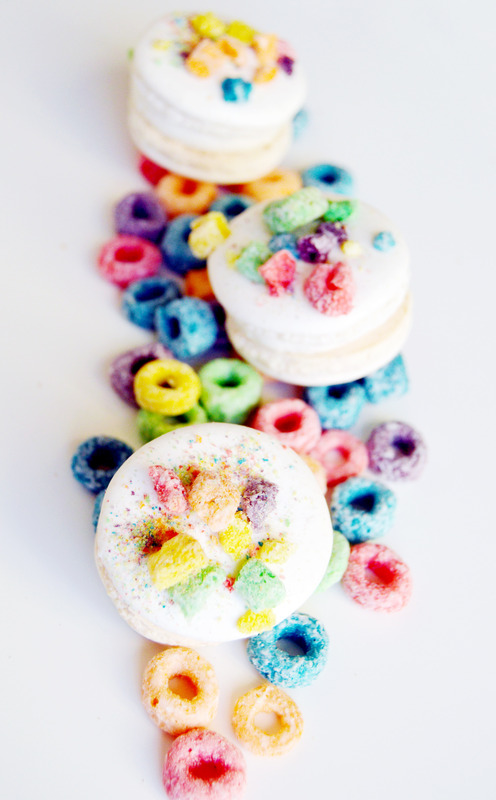 do they really still sell fruit loops? Thank you, Mimi. They sure do! 🙂 It’s always surprising how many childhood favorites still exist on the shelves today. This is the coolest post ever! 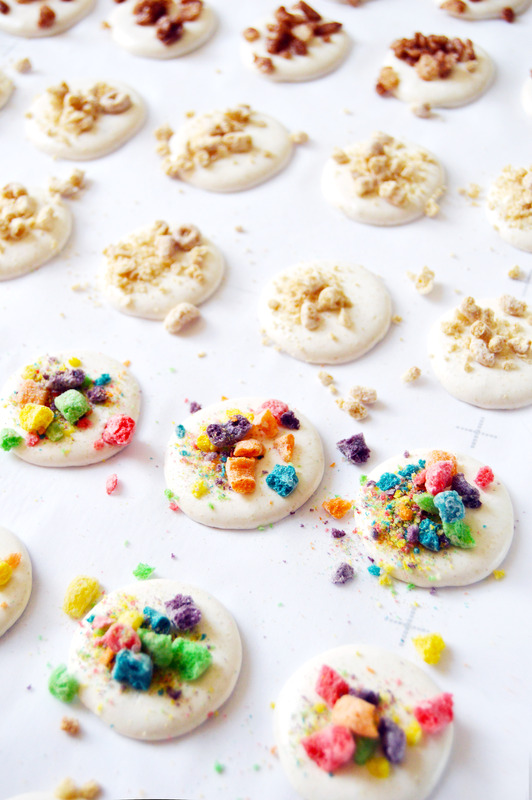 I just love baking with cereal – your photos are gorgeous! This is so cool and super creative!! But how many macarons does it make? 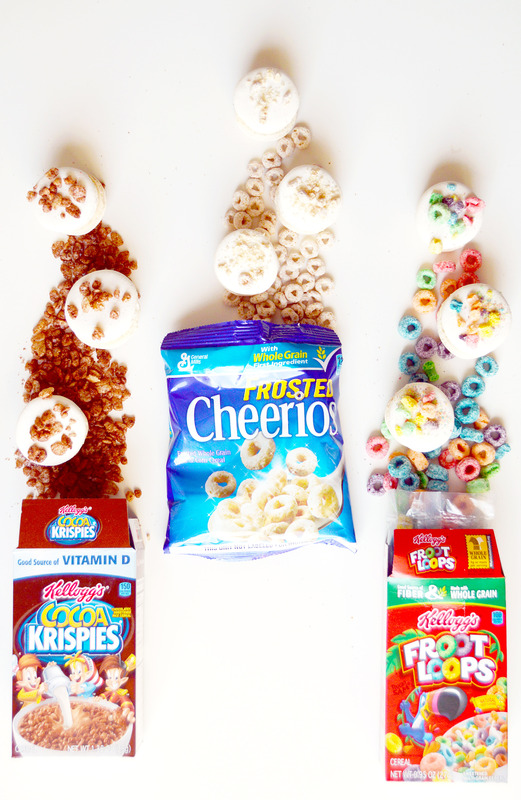 Does the cereal on top get soggy from the chilling process?